Jewelry, Christmas Train and Trees, Plates and more. Every True Blue fan of the incomparable Elvis Presley™ knows that Elvis™ loved the holiday season more than any other time of year! Now you can celebrate the holidays with Elvis and the Taking Care of CHRISTMAS train collection, available exclusively from The Bradford Exchange, Hawthorne Village Division. Your collection begins with Issue One, King of Rock & Roll™ Steam Locomotive. It won't be long before you receive Issue Two, He's Coming to Town Tender, and FREE 14-piece track set, power pack and speed controller - a $100 value. Soon your collection continues with Issue Three, Rockin' Christmas Gondola with removable sculpture, and additional Elvis holiday train cars, each a separate issue to follow. This real working train, which runs on HO-scale track, is resplendent in shades of shiny blue and gold. It features handcrafted and hand-painted cars, many with removable sculptures of Elvis at Christmas time! You'll marvel at the wealth of authentic details on this illuminated electric train collection that's masterfully crafted for years and years of enjoyment. The classic diesel locomotive even features a working headlight, and the tender is filled not with coal but with a treasure trove of Elvis treasures - like a hound dog, gold records and more. 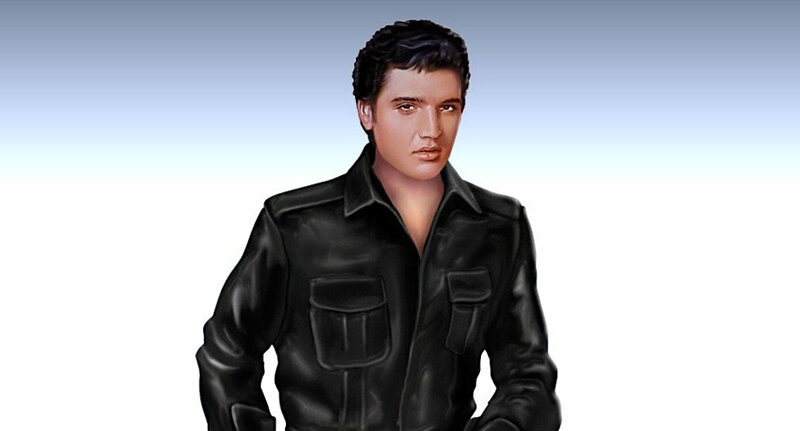 This Elvis Presley collectible is a must-have for any Elvis fan. Strong demand is expected, so don't delay. Order now! Bring the electrifying energy and dazzling style of Elvis® home for the holidays with this illuminated and musical Elvis Presley® Christmas tree collection, exclusively from The Bradford Exchange, Hawthorne Village Division. Officially licensed by the Estate of Elvis Presley, the Happy Holidays from Graceland™ Christmas Tree Collection puts holiday cheer in the spotlight, starting with Issue One, Graceland. Soon, your collection will continue with Issue Two, the 3-ft. Pre-Lit Christmas Tree and followed by Issue Three which includes the FREE snowy white tree skirt, and additional issues featuring sculptures and Elvis "45s" ornaments, each issue to arrive separately. A masterwork of handcrafting and hand-painting, this impressive Elvis® musical holiday tree display shimmers with light, from the warm glow of the lights inside Graceland to the Christmas star atop the tree. The complete collection includes silvery Elvis "45s" ornaments and the grounds of Graceland decorated in fine holiday fashion, with Elvis himself on hand to greet you! Plus, your Issue One, Graceland, even plays a music box rendition of "Blue Christmas" for a perfect Elvis Christmas celebration. 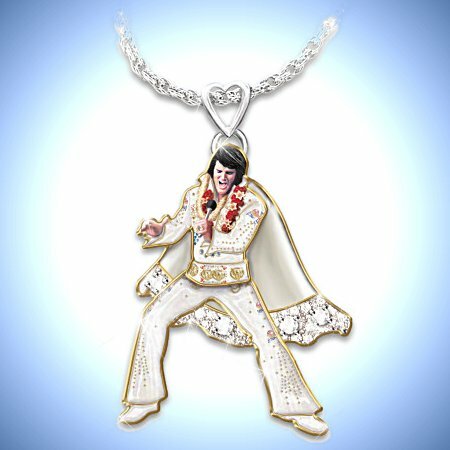 Eager demand is expected for this unique Elvis Presley Christmas tree collection, so hurry - order now! Elvis®'s mega-hit Christmas albums continue to brighten fans of all ages every year during the holiday season. It's a known fact that the King of Rock 'n' Roll™ truly loved Christmas. Now, you can bring that spirit home for your own holiday with this spectacular musical Elvis Christmas tree featuring a fully decorated and illuminated mini-holiday tree and a sculpted Elvis. Recalling Elvis's legendary glitz and glitter, this holiday tree is decked out in dazzling, seasonal rock 'n' roll style. Surrounded by festive holiday gifts in honor of beloved Elvis hits, including a teddy bear, blue suede shoes and a hound dog with a heart tag that reads "Love Me Tender". Exclusively from The Bradford Exchange in a limited edition, the tree base showcases classic art of the King® by acclaimed artists Bruce Emmett and Nate Giorgio. The mini tree features shimmering branches and glittering Elvis-inspired ornaments and is beautifully illuminated by 15 multi-colored LED lights. For the perfect finishing touch, Elvis's signature TCB® lightning bolt symbol lights up as the tree topper. And there's more, this musical Elvis collectible plays the hit melody "Blue Christmas™" at the turn of a key. 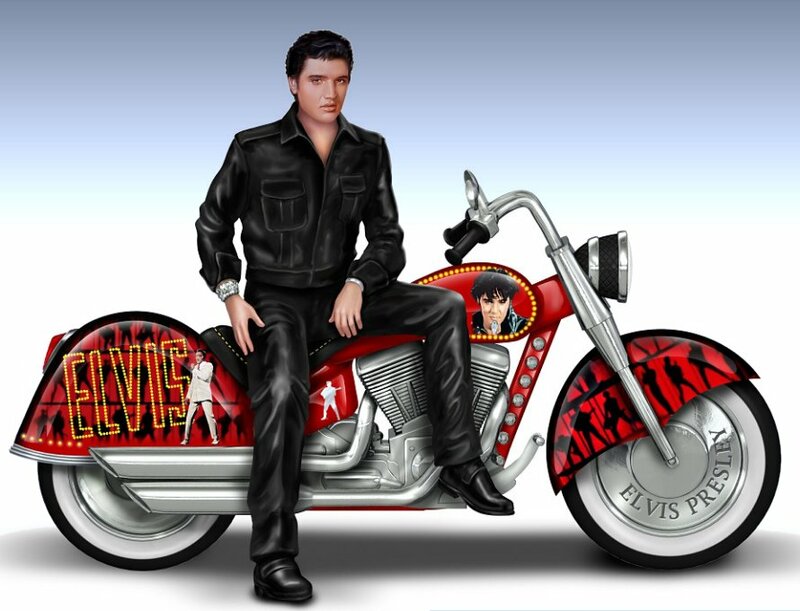 Strong demand is expected from Elvis collectors, so don't delay, order now! When the incomparable Elvis Presley® recorded "Blue Christmas" for his 1957 holiday album, it instantly became a beloved Christmas classic. Now, make the timeless legacy of Elvis® a part of your holiday traditions with this limited-edition Blue Christmas Wall Decor, an officially licensed first-ever available exclusively from The Bradford Exchange. Featuring never-before-seen specially commissioned holiday imagery of Elvis and Graceland by famed celebrity portraitist Nate Giorgio, this superbly handcrafted, gallery-quality genuine canvas print measures nearly two feet wide and is beautifully framed, complete with a silvery inner gallery border and gleaming title plaque. Best of all, this spectacular illuminated wall decor treats you to a wondrous display of both lights and music! The breathtaking artwork, awash in shades of blue, illuminates at the flip of a switch with both fiber optic and LED lights, hidden behind the canvas to recreate the sparkling effect of snowflakes twinkling over Graceland and adding a real-life radiance to the silhouette of Elvis from behind. Hand-applied glitter adds even more dazzling radiance to the Graceland scene while an instrumental rendition of the beloved song "Blue Christmas" fills the air. 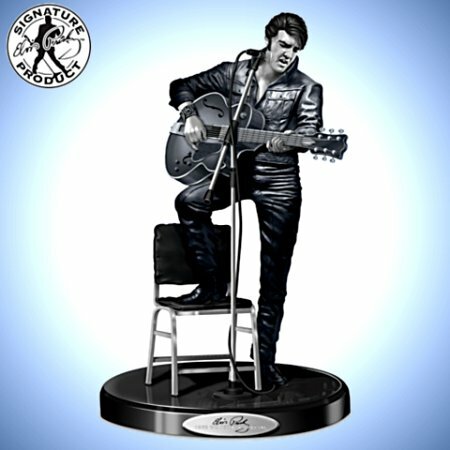 Intense demand is expected for this premiere Elvis Presley collectible, so don't wait - order now! Whether showing off his dreamy smile, his show-stopping moves or his one-of-a-kind voice, Elvis Presley™ stole the hearts of millions around the world. Now, you can honor your love of Elvis Presley with the Elvis™ Burning Love Tote Bag, a fashion design original exclusively from The Bradford Exchange. Taking center stage on this women's quilted tote bag is a montage of classic Elvis images along with Elvis's signature. 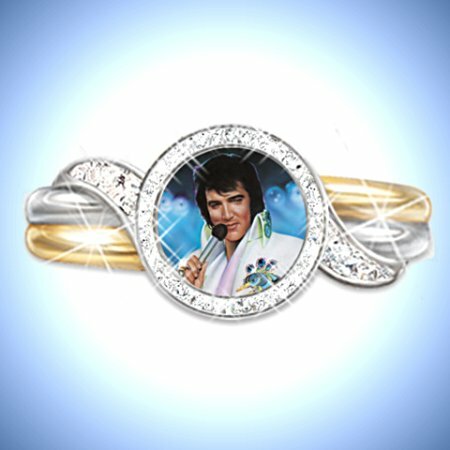 It's a rockin' treat for fans of Elvis and fashion. Expertly crafted of high-quality quilted fabric with a stylish ombre coloring and gold-colored piping, this fine tote bag is just as fashionable as it is versatile. A top zip closure keeps your belongings secure, and an inside zippered pocket plus two slip pockets provide extra space for organization. A sparkling silvery heart charm with the words "I [heart] ELVIS" dangles from one of the straps as the perfect finishing touch. A stellar tote bag for fans of the King of Rock 'n' Roll™, strong demand is expected for this Creative Expressions™ apparel, so don't delay. Order now! Filled with glitz, glamour, eye-popping jumpsuits and unbelievable music, an Elvis Presley® Vegas show was designed to thrill you to the core and leave you wanting more. Now, the magic of the Vegas era is recaptured in the first-ever Elvis Presley: Showcase Of The King Sculpture Collection. An Elvis® extravaganza, your collection begins with Issue One, The Golden Standard (plate) and will continue with Issue Two, Aloha From the King (figurine). Soon, you will welcome three more issues to your display, A Rock 'n' Roll Legend (tribute guitar), Marquee Magic (sculpture) and the custom, wooden display shelf to complete this 5-piece collection. Each issue will arrive separately. 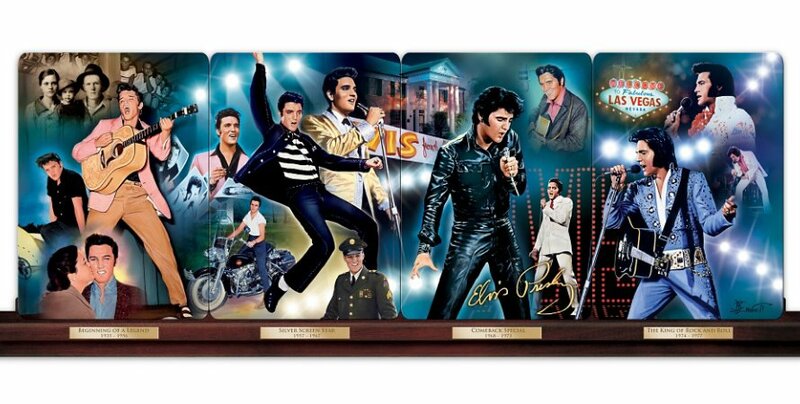 Created with Elvis Presley fans in mind, this dramatic 15-inch wide 5-piece tribute display is handcrafted exclusively for The Bradford Exchange under the hallmark of Rhodes Studios and is officially authorized by the Estate of Elvis Presley. A 22K gold-banded "gold record" collector plate in Heirloom Porcelain® and a 13" long tribute guitar pay homage to the King of Rock and Roll® with classic Elvis imagery by acclaimed artist Nate Giorgio. A hand-cast, hand-painted Elvis sculpture celebrates his landmark 1973 "Aloha From Hawaii" concert and a sculpture of the iconic marquee that Elvis performed in front of for his Comeback Special illuminates at the touch of a switch. Fervent demand is expected for this rockin' Elvis tribute collection and it's only available in a limited edition of only 5,000 worldwide - order now! From his first appearance on television to his sold-out concerts, Elvis Presley™ changed the face of popular music. His songs remain a timeless tribute to an entertainer without peer. Now, rock every minute of your day with the Elvis™ Rock 'n' Roll Wall Clock, a first-of-a-kind exclusively from The Bradford Exchange. This officially authorized Elvis Presley collectible is illuminated, fully sculpted and hand-painted in the shape of a 1950s jukebox and the clock lights up with brilliant LED lights in alternating colors! Stunning portrait art of the King™ graces the clock's face and center while a specially designed gold record - complete with his replica signature - serves as the pendulum. 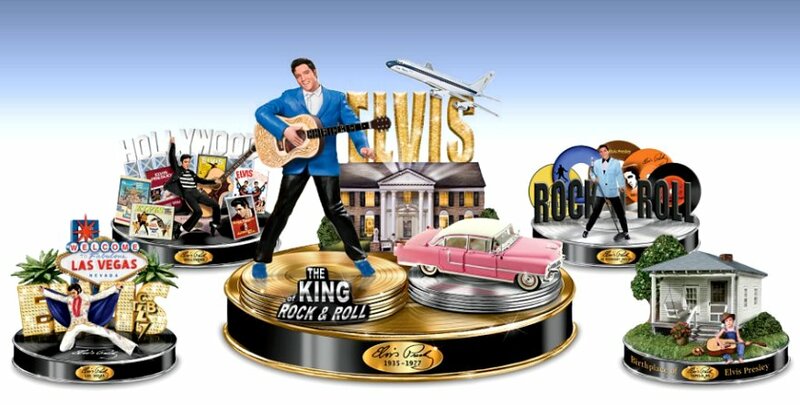 At the top of every hour, a turntable-style base rotates to reveal various figures of Elvis at four different stages of his legendary career as an emcee's voice announces "Ladies and gentlemen, the King of Rock 'n' Roll™" to thunderous applause! This impressively sized wall clock is a must-own for any Elvis Presley fan. Demand is expected to be strong. So, don't waste time; order now! In 1957, fresh from the success of his first film, "Love Me Tender", 22-year-old Elvis Presley decided he needed roots and purchased an old Memphis mansion that would become internationally known as Graceland®. Although he would own other places throughout his life, Graceland® was always his home with a capital "H" - the one constant in the whirlwind life he led. Now, you can bring the warm memories of Elvis's beloved home into yours with the Welcome to Graceland®! Sculpture, available in a strict limited edition of 1,957 worldwide exclusively from The Bradford Exchange, Hawthorne Village Division. A specially designed Masterpiece Edition, this officially-licensed Elvis Presley collectible is expertly handcrafted and hand-painted to recreate the iconic facade of Graceland. Two- and three-dimensional and low relief sculpting brings amazing depth to the scene. What's more, hidden LED lights illuminate the rooms inside with a welcoming glow! A fully-sculpted vintage motorcycle and pink car are parked in front, and a smiling Elvis figure greets guests at the gate as "Love Me Tender" sweetly plays in the background. This exceptional musical sculpture arrives ready to proudly display in a place of honor in your home. Considering the continued popularity of Elvis Presley and the strict edition limit, we expect strong demand. Therefore, you are urged to avoid disappointment and order now! Some stars shine brightly but for a few precious moments. Others cast a light that can be seen forever. Elvis Aaron Presley, in the short time he was with us, left an indelible mark on the world. Now, honor the 40th anniversary of his passing with this officially licensed Elvis Presley 40th Anniversary Commemorative Collector Plate, available exclusively from The Bradford Exchange in an edition limited to just 2,107 worldwide. 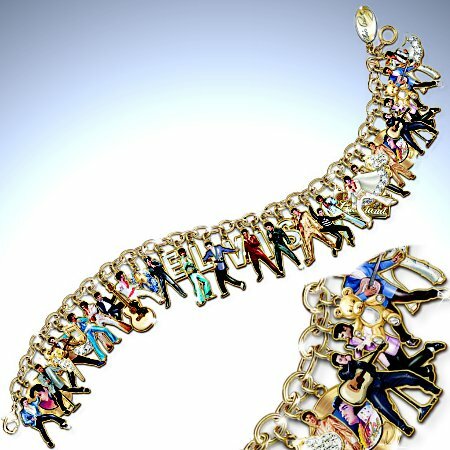 It's the perfect tribute to the greatest entertainer of all time! Grandly sized at 12 inches in diameter, this extraordinary Heirloom Porcelain® collector plate is finely crafted to bring you a visual biography as dynamic as Elvis himself. Eight portraits of Elvis perfectly radiate his unique charisma throughout his career, each exquisitely recreated in vivid color and detail, highlighted by the famed '68 Comeback Special red "ELVIS" marquee. A gleaming 22K-gold rim hugs a specially designed inner border featuring a guitar motif. A custom-crafted, satin-lined Deluxe Presentation Case is included, perfect for storage or gift-giving. Intense demand is expected for this must-have Elvis Presley collectible, so do not delay. Order now!